LOS ANGELES, Calif. (CitizenWire) — Time and Gems (www.TimeandGems.com), an independent Rolex(R) retailer offering premium Rolex customizations, today announced a diamond Rolex watch giveaway valued at $7,000 as a thank-you to all new visitors of their Web site that sign up for their bi-weekly newsletter. Pre-owned Rolex watches are relatively unknown to many. Most people end up buying their first Rolex at an authorized dealer brand new. What they don’t realize is that most pre-owned Rolex watches sold by independent retailers like Time and Gems look and function like they’re almost new, having been fully polished and serviced, and can cost up to 70% less than their new counterparts. Time and Gems offers over a thousand Rolex watches on their Web site, making them one of the largest independent Rolex retailers online offering models in both factory original as well as customized in different colors and configurations that Rolex does not offer. Time and Gems has been selling luxury watches, specifically Rolex, over the past 30 years and retailing to customers worldwide online for the past 9 years. They have over a thousand Rolex watches in stock, including new, used and vintage models making them the largest online retailer of Rolex watches in the USA. All watches are restored by Rolex-certified watchmakers to like-new condition and come with individual appraisals and a 1 year warranty. They can be found online at their Web site www.timeandgems.com or at their store located in the heart of the Downtown, Los Angeles Jewelry District. 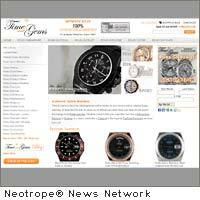 Time and Gems is an independent company not affiliated with any watch manufacturer or distributor. Rolex(R) is a registered trademark of Rolex Watch U.S.A. and Rolex International. News Source for this Press Release: Time and Gems :: This news release was first issued by and is Copyright © 2010 the Neotrope® News Network – all rights reserved. Originally published on CitizenWire™.